Ever since childhood, you have heard that you should be grateful for what you have and that you should focus on it more than any negative issues or situations. There is good reason for this because those who practice gratitude are more likely to have a positive life and better health. Research has been done on those who tend to be grateful versus those who tend to focus on the negative. Those who were always thankful for what they do have were happier, healthier and more likely to be successful. When times are tough, it can be difficult to keep gratitude at the forefront of your thoughts. However, you can ensure that it is a primary focus by writing down what you are thankful for. Take a few minutes each day jot down anything that is causing you to feel grateful. If you find yourself having a hard time remembering to be grateful, you should refer to what you have written down. People who are grateful for the good things in their life tend to attract more good things, allowing them to be even more grateful for everything that they have. This is something to remember when you are trying to find the motivation to focus on the good when bad things are happening. Just think about it, when you are in a positive mood, you tend to have a good day even when small things happen that may throw you a little off track. 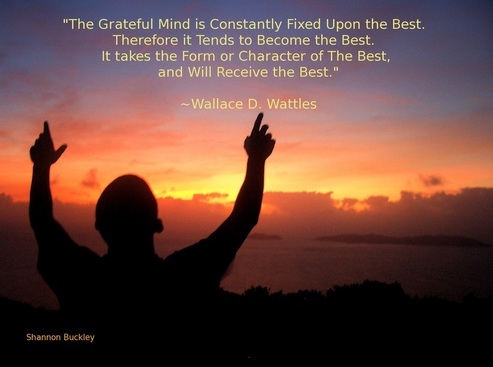 Gratitude works in the same manner and will help to keep you happy and positive. People avoid those who are always negative and focusing on the bad points in life. Think about someone you know who has many things to be thankful for, but they are constantly complaining about things. Do you go out of your way to spend time with this person? The answer is most likely “no” because you do not want such a negative influence on your day. If you are focusing on the good, the people in your life are going to put more positive focus on you and you can also help those in your life who could afford to show a little more gratitude. If you are focusing on the bad, it clouds your mind and makes it harder to solve problems that are occurring. Because of this, if you focus on the good, your mind is more open to find the answers to issues in your life and other areas. For example, if your hours are reduced at work, this means less money for your household. However, if you focus on still having a job, you have a clear head to create a better budget for your family. This is important and it will lead to you being grateful for what you have so that you can better utilize it. Negativity is everywhere, but this does not mean that you have to constantly feed into it. When you have something bad happen, think about the positive aspects. For example, if you get skipped for a promotion, think about why and use this as a positive experience to get better at your job. This can lead to more promotions in the future and this is definitely something that you can be thankful for and look forward to. Those who are grateful have a clearer head and a more open mind, making it easier to learn. They are better able to tackle challenges and get things done. They are also able to see the good points of all opportunities even when those opportunities may not work out in their favor. This ensures that they are able to better themselves and get more and better opportunities in the future. Being grateful is something everyone can afford to do more and with conscious effort, you will find that you naturally become a more grateful and positive person. There will always be times when you have to really reach in your back pocket and remember to be grateful and these are the times when feeling this way counts most. For example, if you lose your job or experience something else that causes a major setback in your life, if you think about what you are grateful for, you will find it easier to weather the storm.